Time Tracking Linux App - What are Your Options? Time tracking linux apps are few and far between. Those available are complex to use and often come with a steep learning curve. This is unfortunate because tracking time is important for both freelancers and employers. A freelance worker needs to be able to bill clients accurately and avoid spending more time than authorized on projects. On the other hand, a hiring manager needs to know how long a freelancer is spending on a task. Both parties need an accurate way to track time fairly. Unfortunately, if an employer has a freelancer that uses the Linux operating, tracking time becomes a challenge. Linux, has a big user community and lots of free software to accomplish many tasks but when it comes to tracking time, the options are limited. However, there are a few time tracking Linux apps that do a sterling job. The following are the cream of the crop. Not to toot our own horn but having carefully looked at the Linux time tracking applications available, we saw it fit to create an app of our own to help freelancers, employers and workers in general track time spent on tasks. Installation is simple and takes less than five minutes. To install, simply create a Hubstaff account and then download the application. Double click and it will install seamlessly. Once installed, it sits in the background, tracks time and records screen shots. The application is designed to be used in conjunction with the Hubstaff website. 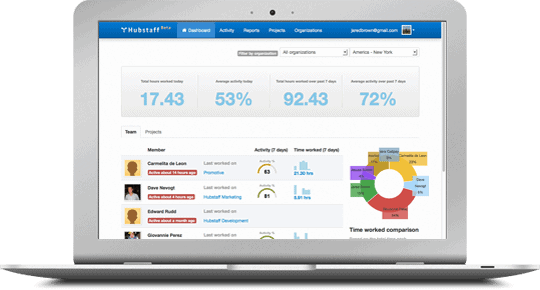 It offers one of the best ways for employers to track what employees are doing and how much time they are spending on tasks. Detailed screen shots allow the employer to see what the employee is really up to. Time tracking data is available in easy-to-digest reports featuring graphs, logs, screenshots and trend analysis. You can track as many projects and workers as you like. The ability to track any project whether billable or not. It comes with simple start and stop buttons that allows you to track your tasks and doesn’t get in your way. You can tag any activity with multiple tags for later sorting. Hamster allows you to see an overview of the week broken down into days, weeks, or month. You can edit this overview manually to your liking. You can see bar graphs showing the amount of time spent on certain tasks, tags, or categories. Hamster also allows you to export your overviews to a printable HTML format. Hamster has a really simple user interface that anyone can use. However, it falls short in a number of areas. For example, despite its simplicity, managing time takes a lot longer than other applications. There are also a lot of things that one has to manually which is a no-no. The reports do not provide deep insights into how time was actually spent. It also doesn’t take screen shots and isn’t therefore a very reliable method of tracking employee time for employers. It is, however, a good tool for personal productivity. The third application on our best-of-three list is Klok. The best thing about Klok is that it allows you to see your time in an easy-to read calendar view. Installation only takes a few minutes but you first have to install Adobe Air. Add the projects you want to track using the “Add Project” button. After that, you can change various project properties such as estimated hours, contact information and color codes. You can also include sub-projects and archive specific projects. The application also offers several ways to track projects and sleek graphs are available to analyze your data visually. A single click can generate great looking reports that provide excellent time tracking feedback. But, and this is the biggie, despite all these excellent features, neither Klok nor Adobe Air are free. Also, AIR is no longer supported on Linux. The Pro version unlocks most of the features that make Klok a great application but it will set you back $19.99. To be honest, it doesn’t really make sense to pay for an app when you can get an app with better features free. That’s it! You don’t have a lot of choices. 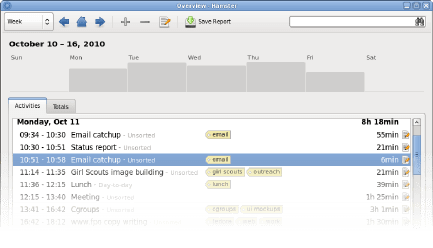 There may be other lesser-known Linux time tracking apps, but honestly, your best bet is Hubstaff. Try it out today by creating a new account and downloading the application. Please feel free to send us a support question if you get stuck at any point. We will be glad to assist. 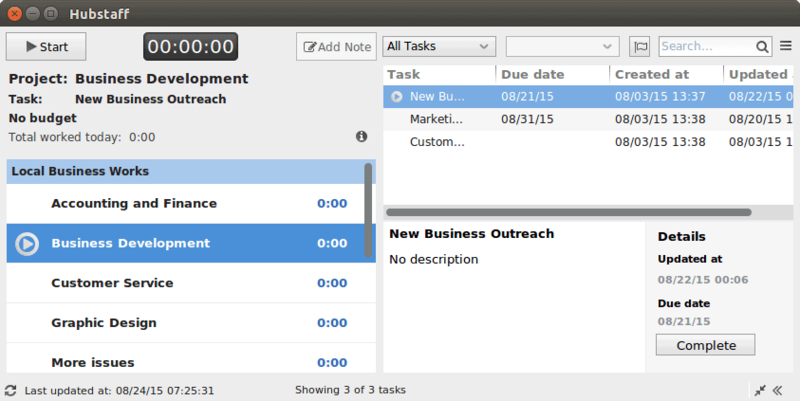 With Hubstaff for Linux, you can track time, take screenshots, monitor activity levels, export reports and create invoices.